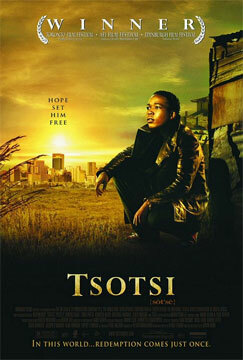 In Johannesburg, a small time criminal, Tsotsi, is a teenager without feelings, hardened by his tough life. After a series of violent gang hits, Tsotsi hijacks a car. However, whilst driving, Tsotsi finds that there is a baby on the back seat. He brings the baby to his house in the slum. The next six days bring about a change in him that couldn't be foreseen.